Over time and adding stray cats to our household, cat aggression surfaced, mainly with my original two cats that have ceded turf to the newcomers. While petting Coty, my smallest cat, I will notice Blaze watching the activity from the doorway. Coty sees him and hisses. He hisses back. I tell Coty it's okay and reach out to pet her again. SWAT! Don't take it personal when this happens.... you are not the target. Coty is simply redirecting her aggressive feelings, aroused by the sight of Blaze. Such instances of cat aggression, redirected or otherwise can be mystifying to cat owners. Whether you do anything or not, cat aggression behavior always has a cause. With patience, understanding and help from a caring veterinarian, you and your cat can work through the aggressive behavior to save your relationship. In the United States, several million cats and dogs are destroyed each year in shelters and pounds. It is believed that one of the main reasons for their surrender is behavior problems. Cat aggression is the second most common behavior problem in cats, the first being inappropriate elimination such as spraying. Remember that cat aggression is a biological response coordinated by different areas within the brain. Although apparently multifarious in its expression, it is distinguished into two major categories: predatory aggression and affective aggression. Predatory aggression is a genetic, "hard-wired" behavior. The cat is interested and alert as he pursues prey or a prey facsimile like a toy, but not emotionally aroused. As he watches and prepares to pounce, he may be quite motionless except for a flicking tail. He hisses and swats with his paws. The cat is hunting. Affective cat aggression is characterized by mood swings. The cat's heart beats faster, the pupils dilate, the fur stands on end, especially on the tail. He hisses and swats with his paws. He may be on the attack or on the defensive, but these are all warning signs that he is in an emotionally charged state. Cat aggression during play is the most common in kittens and young cats. It can represent rehearsal of either predatory or affective aggression. The owner with ruined nylons was probably the subject of her kitten's predatory play behavior, as is someone whose cat swats at his hands as he talks and gestures. What kind of cat is most likely to exhibit signs of play aggression? Many times it's a single kitten about six months of age that has no one to practice with. Lacking a companion cat to frolic with, the kitten turns its attentions to its owner who subsequently becomes the target of all that undirected energy. Consider yourself to be a large squeaky toy. The solution for owners is to redirect the cat's attention from their bodies to a moving toy. Motionless toys are perceived as "dead" and therefore of little interest to the cat. A cat will be interested in a toy only if it moves as a prey object...a mouse or a bird...would move. To redirect the cat's interest get a fishing-pole type of toy or even a piece of string. As you wiggle the toy, keep your body still. The cat will chase the movement, not you. Even better, if at all feasible, get another cat for your cat to play with. Be careful, though, sometimes getting a second cat can lead to territorial aggression between the cats. When a new cat is introduced or when two strange cats are thrown together, conflict can sometimes result. Initially two newly introduced cats may circle each other warily and voice their displeasure, but the conflict never comes to blows. In other cases, the resident cat will immediately and relentlessly persecute the newcomer (especially if it's a kitten) forcing her into hiding under a bed or in a corner. I have a case like this with Revlon, one of my two Calicos that have been with me for over 11 years. Her constant badgering of Chanel #5 who is only 4 years old has continued the entire 3 1/2 years that Chanel has been with us. So, as others have discovered, the form of treatment is to separate the combatants. I put them in different areas of the house. With cats younger than Revlon, you can gradually reintroduce the kittens to each other, first behind a closed door, then lured together by food. Eventually, they can increasingly be fed within sight of each other, and so on. Be forewarned...the process can take months. It's not just other cats that are recipients of territorial cat aggression...dogs, children, and adults can be victims also. I read of an extreme case where a young English woman was bitten and scratched severely about the neck and chest when her boyfriend's Siamese attacked her as she walked to the bathroom one evening. 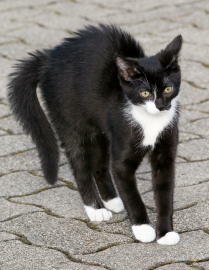 Redirected cat aggression is where cats who have been getting along fine can be driven apart by redirected aggression. This happened with Revlon and L'Oreal Blaze, sisters and housemates who had formerly been "best buddies", curled up together like a couple of inverted commas... and suddenly started fighting. In our case it was taking in another stray but the trigger is often that one cat sees something outside the window, perhaps a stray cat wandering in the yard...that either angers or frightens her. She leaps down from the windowsill with eyes wide open and fur erect (signs of both fear and aggression) only to encounter her buddy. SWAT! Although this misunderstanding happens in seconds, it can take weeks or even months to undo the psychological damage. Propagation of the aggression is facilitated by memory. One cat becomes the aggressor and the other flees until it is cornered and must turn to fight. Revlon and Blaze were at odds with each other for months and the behavior can be a vicious cycle. Once set in motion it keeps going. However, medication helps. Within a short time on meds both were okay with each other but the real close bond is gone. At least meds are no longer needed. Medications, such as the anti-anxiety drug Buspirone, placate the negative emotions. It allows the cats to interact without the fear-aggression pattern that's been established. It takes patience and a systematic approach to change a cat's mind, and thus its behavior. One instance is a woman who had a friend visit with a new baby and when the friend left, her own cat attacked her. The cat hadn't even seen the baby but her friend had placed the baby on the bed to change a diaper and the cat acted on its confusion by going after its owner. However, once the cat was settled down and given treats, it began to associate the owner with pleasant experiences again and the problem was solved. There are various other kinds of cat aggression your cat can suffer from. Pain-induced aggression is if a cat is suddenly hurt, for instance if its tail is accidentally caught under a chair leg. The cat will attack and race around. Pain-induced aggression is reflexive...easily understood by anyone who's ever whacked their thumb with a hammer. Owner-initiated aggression is not a result of cruelty, but of love. This occurs when an owner tries to pet a cat who simply doesn't want to be petted. These "alpha cats" like to be in charge , unlike other cats who enjoy petting as a form of mothering. What to do when you've got a General Patton for a pet? Ration petting, teach one new trick per month, and set limits. Another situation that can be positive is to create "petting zones". Blaze is a bit aloof and can strike out if she doesn't feel like being petted, but tap the bottom of the bed and wait a minute, she will often hop up to be petted and purr like a rusty gate. She associates that spot with being petted and will only jump up when she wants the attention. Remember, though, that just because your cat objects to prolonged petting doesn't mean that he doesn't love you. Pharmacologically-induced cat aggression is a type of aggression that is rare. I did read of one well-known case of an owner who took his cat for a flea treatment. Soon after he found piles of tiny birds and mammals awaiting him each morning. The flea product used included anticholinesterase, a compound that causes the neurotransmitter acetylcholine to build up in the brain, and both the owner and his cat had absorbed it and been affected by the chemical. So be careful when using flea products...avoid using too much and don't inhale the flea sprays or powders. Be vigilant and when a pet becomes aggressive don't give up easily. Most of the cases can be solved using separation/reintroduction, medication, or a combination of the two. A few are more difficult and it is rare that a cat has to be separated permanently or given away. My Revlon is one of the difficult ones that I'm still working on. Hang in there and your patience will probably be rewarded. Remember there is usually a cause for cat aggression even if it's not readily apparent. Try working with an animal behaviorist before resorting to giving up your cat or check out an online medication source such as Entirely Pets for some items like Feliway plug-ins that help reduce anxiety. Just enter Feliway into their search box. Pet Care Choice is another resource where you can save on Pet Medications.